W M Birchall (American; b.1884). 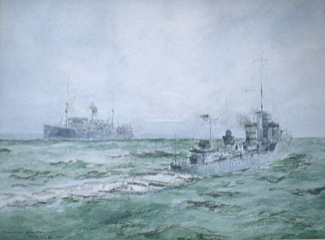 Watercolour signed and dated 1920. A destroyer of the V & W class guarding a merchantman - World War 1 and possibly before the introduction of convoys in 1917 as this appears to be a lone merchantman.